Home > Blog > Can I Use My Fireplace When It’s Raining? Can I Use My Fireplace When It’s Raining? The old saying goes “when it rains, it pours”, and that certainly applies to your excitement and anticipation of being outdoors. Rain generally forces people inside where they want to dry off and warm up. Fireplaces, especially wood-burning ones, can provide a rare heat that’s impossible to replicate with a home furnace or other type of artificial heating. 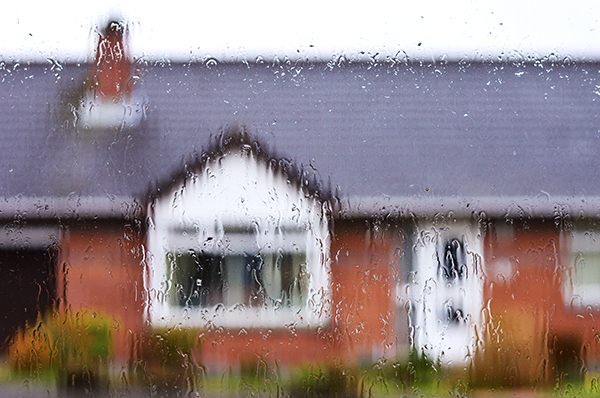 As a result, many homeowners seek fireplace heat during a rainstorm. 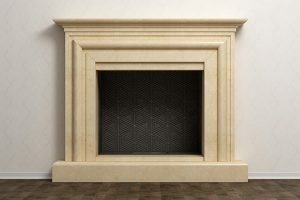 Does it present any harm or wear on your fireplace? What about the chimney or liner? 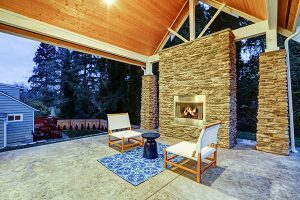 A fireplace system is designed and constructed to keep rain out. Since fireplaces produce an immense amount of heat, and because heat also rises, it takes a very high downward pressure of moisture to prevent it from working correctly. Fireplace chimneys are also built with a design that blocks as much moisture from entering the fireplace as possible. 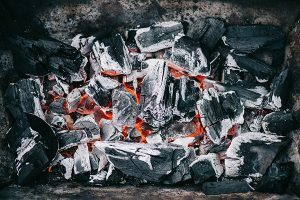 So, you may have a downpour outside, but a fireplace and chimney that’s in high working order should prevent little to no moisture from reaching the bottom of the pit. It allows you to continue burning and keep yourself warm until the rain subsides. In fact, the biggest threat to fire not starting in a fireplace is actually not rain, but high winds because it drafts so much of the air out of the fireplace shoot. 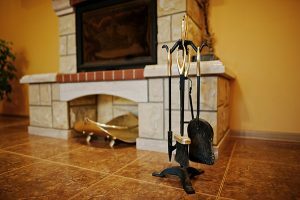 How do chimneys prevent rain and snow from entering a fireplace? A chimney cap is a flat, rectangle piece usually built with some type of metal. It is placed directly above the top of the chimney and supported by legs. Some people refer to chimney caps as umbrellas, which is a fitting term because that’s exactly what it looks like. The cap provides shelter for the opening of the chimney while also not completely blocking out smoke that’s attempting to exit the top of the chimney. Chimney caps also generally have a screen that helps keep birds and other small critters out of the chimney and climbing down to the rest of your home. The biggest hassle with chimney caps is they sometimes inadvertently direct smoke and wind back down the chimney instead of leaving it. The reason is because the cap serves as a partial blockage. On one hand, it reduces the amount of rain and snow that comes down the chimney but also limits the amount of smoke that exits. 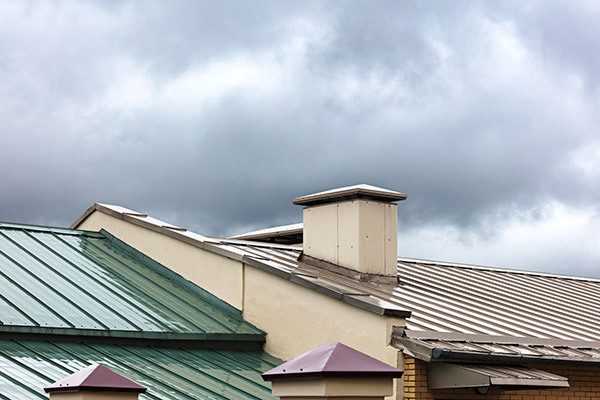 Chimney cowls are considered a far better option than a chimney cap for homeowners that live in high wind areas. The cowl has a similar purpose to a chimney cap. The biggest difference is the cowl can block one side while having an opening on the other. For example, if you generally get the wind out of one direction, you can have the cowl block airflow from that side while allowing smoke to escape from the other side. Chimney cowls are common in industrial settings because factories use them to prevent nasty chemical smoke from filtrating back into the factory. Therefore, if you decide you prefer a chimney cowl over the cap, you’ll probably have to browse through industrial options before finding one that’s more suitable, or looks better on a home. Chimney caps and cowls are both effective at keeping out rain, however, if you really want to go the extra mile you should consider investing in a damper. Chimney dampers are really popular in places that get a lot of snow. Dampers are usually a little more durable than the aforementioned chimney tops and are adjustable, which some homeowners really prefer. The heavy-duty construction that’s usually made out of some type of metal can withstand the higher weights of snowfall compared to rain, and thus do a great job of keeping moisture out of your house. Chimney dampers are adjustable with a trap door or gate that can get cracked open at various angles, or completely shut. Some people elect to have the damper shut until they go to burn wood. That’s completely acceptable, so long as you remember to open the damper before you start burning fuel. If not, your home is going to start getting very smoky, immediately. It is perfectly acceptable to use a fireplace while it rains, especially if you have invested in a chimney cap, cowl, or damper. You can also take an additional step to keep your chimney waterproof by using a water-repellent on the exterior masonry work. Water repellents on chimneys are fine as long as it is not a masonry sealer. It is vital that the chimney still “breathes”, so the best technique is to use a sealer that doesn’t lock moisture in and lead to gradual damage of the structure. A vapor-permeable water repellent designed for masonry will suffice. Chimney maintenance and cleaning are considered to be one of the highest priorities for homeowners everywhere. At Early Times, we have over 30 years of experience with chimney inspection, cleaning, and maintenance. Speak to a specialist today and get a free quote online today.